Holidays are the perfect time to talk about family medical history. It’s a time when extended family gets together, which may not happen often because of distance and scheduling. Weddings and funerals might be less than optimal times for a variety of factors. During holidays where quality time is spent together, family members can help each other remember events (especially those that occurred long ago) more clearly. Putting together a strong family medical history can be a difficult task. Tummy troubles in particular are challenging for people to talk about, and there may be family members who do not want to discuss medical problems. In the case of family members who have passed away, such as grandparents or great-grandparents, it might be that their children or siblings will have a vague idea that a digestive problem existed, but there’s usually no information about a diagnosis or treatment. In cases where there was treatment, the diagnosis may have been with an older term that is no longer used, such as ileitis. Digestive problems are not likely to come up in casual conversation, which is why asking the right questions may be the only way to get an accurate family history. Have any family members ever been diagnosed with Crohn’s disease, ulcerative colitis, or another type of IBD? The risk of IBD is about 10 times higher for people who have a family member with IBD. For those with a sibling with IBD, the risk is about 30 times higher. Have any family members ever been diagnosed with irritable bowel syndrome, colitis, gastritis, or another digestive condition? It’s common, especially years ago, for IBD to be misdiagnosed as another condition. In other cases, there may not have been a diagnosis or the diagnosis may have changed over the years. What were the symptoms? Were there any other problems outside the digestive tract? IBD can cause extra-intestinal problems too, and in some cases, they may be even more troublesome than the digestive ones. Understanding the full picture can help in knowing if there is more to the story. Has anyone in the family had colon cancer? There is a strong relationship between IBD and colon cancer, so knowing about a family history of colon cancer is extremely important. If a family member had colon cancer, try to find out at what age they were diagnosed. Knowing the age at diagnosis can help a physician determine when other family members should be screened for colon cancer. Having information about family gastrointestinal history, it can help to put it on paper (or in the computer). 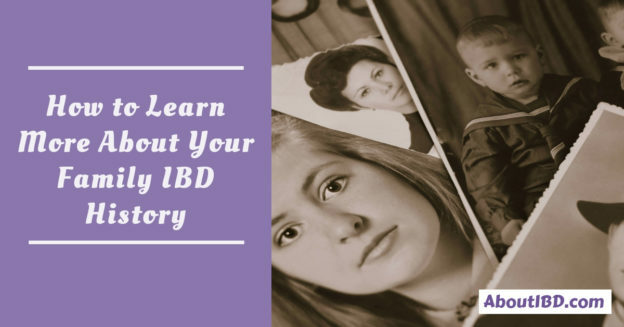 Creating a list of family members and how their medical history may relate to digestive problems or even IBD can be illuminating. Creating a family tree can also be helpful. Start with yourself, next add immediate family, and then continue to connect other extended family members. This exercise can give quite a good picture of how digestive conditions run in the family. Colon cancer in particular is important because it has implications for screening; a gastroenterologist may recommend screening at a younger age than those with no family history. Hey! Wanna hear from me on the regular? Click the button! Crohn’s and Colitis Foundation. “About the Epidemiology of IBD.” http://www.crohnscolitisfoundation.org 1 Jun 2012.